In my column yesterday on crime rates, I noted that recent increases in the violent crime index were mainly caused by increased recording of minor crimes like uttering threats and common assault (meaning assault without a weapon and no bodily harm). As an experiment, I put together a couple modified crime indices that use only serious crimes. These indices use only crimes listed by Stats Can as having above average weight for severity and normalized so that 100 is the Canadian average in 2006. Here are the results. Serious violent crime in Canada has fallen about 20 percent since 2006, which is very impressive progress. 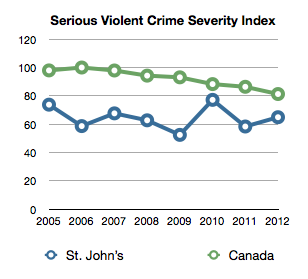 St. John's has held pretty steady and remains below the Canadian average. 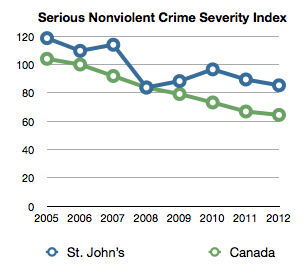 Serious nonviolent crimes have fallen about 40% in Canada since 2006 and have fallen about 30% in St. John's. Impressive progress all around. Here are some tables ranking Canadian metropolitan areas in terms of these crime indices.